After an amazing display of feat at E3 2015 and gamescom 2015, EA has decided to give everyone at home a chance to get into the fun before Star Wars Battlefront launches on November 17, 2015. With a Beta, which will be coming in early October to PlayStation 4, Xbox One, and on Origin for PC. The beta will feature 40-player multiplayer battle, 2 maps and 2 modes which are: Walker Assault on Hoth and Survival Mission on Tatooine. In addition, there will also be a third mode called Drop Zone, more details on that in the weeks to come. More details on www.StarWarsBattlefront.com. EA also took the time to announce they will be releasing a companion app for Star Wars Battlefront. "As part of the Star Wars Battlefront Beta we are also happy to reveal the Star Wars Battlefront Companion experience. Available during the Beta at www.StarWarsBattlefront.com, the Star Wars Battlefront Companion experience features the strategic card game Base Command, and lets you earn in-game Credits that unlock Star Cards, weapons, and more in Star Wars Battlefront. In addition to Base Command, the Companion also lets Rebels and Imperials alike check game stats and progression, customize load-outs and appearance, connect with friends, and get notified when they’re playing Star Wars Battlefront – as well as gather intel on their stats and progression so you can see how you match up! The Star Wars Battlefront Companion will be available on web and in the Apple App Store™ and Google Play™ store prior to the release of Star Wars Battlefront on November 17." Just from this paragraph of the press release we can gather a ton about the personalization features of Star Wars Battlefront. “in-Game Credits”- this mean there will be in game currency for in game unlocks. Star Cards- Unlocks will be RNG, oh god I hope this doesn’t lead to micro-transactions. “check game stats and progression”- It’s confirmed now an exp ranking system in the game. “Customize load-outs and appearance”- Yes, now this makes me happy custom load out and appearance takes a win. Hopefully it will be multi-leveled for example: color, individual Armor pieces, I want a cape on my storm trooper, and green visors. 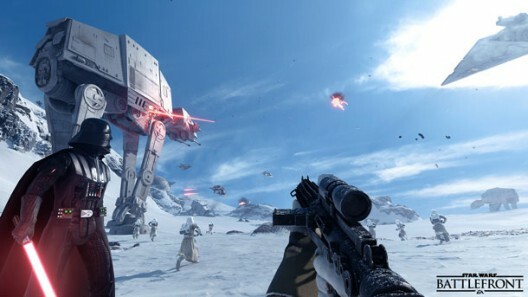 The star Wars BF3 announcement is already better than Black Ops 3 beta. So excited, Spilled my milk and did a Shoryuken!